Please enjoy the show, along with hors d’oeurves and refreshments! Britta Renwick is a long time Gallery 200 artist. This is show is a family affair. spanning 3 generations of her family. The following is Britta’s description of the show. Klaus Luebben: My dad is the original artist 🙂 The show features an oil painting that he painted in 1963. We brought it to West Chicago just a few months ago especially for this exhibit. When my parents moved to Switzerland at a very young age they started with nothing/ My mom was home with 2 little children and my dad worked a full time job. My dad also went to school every night, trying to make a better life for the family, but in the meantime the money from his job was not enough. To relax from all the stress my dad started painting on weekends and every free minute he could squeeze out of the week. Soon he discovered that people were interested in buying his art. He successfully sold many of his paintings and my parents were able to buy food for the family with that money. That’s why my dad likes to say that his paintings were “eaten up”. Karen Luebben Erni – my sister. She gave one of her paintings to our youngest son Alec. This is how she came to be part of our Exhibit. It was clear from the start that my sister Karen inherited my father’s talents. Karen has been painting for all her life and has taken many classes from all kinds of artists. Britta Renwick, Gallery 200 artist for many years. I love all kinds of art. Be it drawing, painting, sculpting, making jewelry. My main outlet for many years was my photography and making jewelry. For this show my sons encouraged me to combine my photography with painting and I came up with Photography made into 3D art. It was a long process of ideas, trials, failures and successes until my pieces came into existence. I am hooked on creating again and have lots of projects I still want to work on. The most wonderful thing about this show is working on if with my sons; the third generation of artists. Sean Renwick – our 16 year old son. As soon as Sean could hold a pencil he loved to doodle for hours on end. Sean never stopped drawing and painting. He has taught himself many techniques and challenged himself to get better. Sean is still unstoppable and draws every free minute he can find in his busy High School schedule. Alec Renwick – our 14 year old son. With Alec it was clear from the start that things had to be 3D. Drawing didn’t capture him for long, but he would crumple up the paper and make shapes out of it. Then came play-doh and clay, and once introduced to origami by his dad he was unstoppable, always folding paper and creating amazing objects. Alyssa Rodway. Sean, Alec and Alyssa met in Karate classes. They have been friend ever since. Alyssa and Sean have similar art interests. They really bonded over their art and grew in their art together by sharing new mediums and techniques. We are very happy that Alyssa agreed to join us for this show. She is not part of the family, but part of Alec and Sean’s generation. 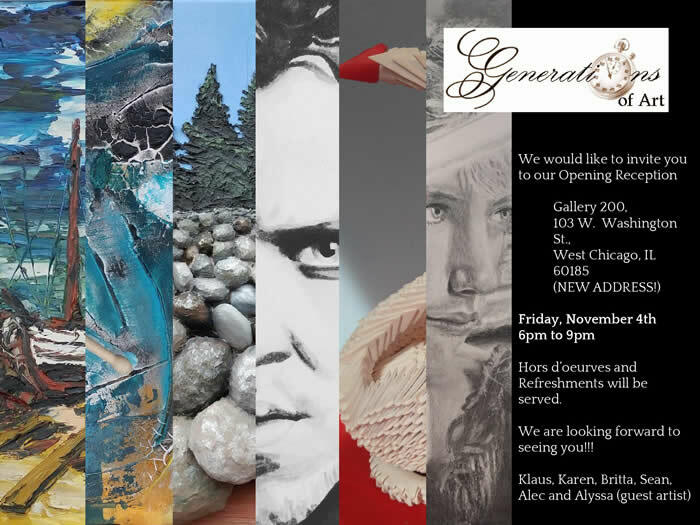 “Generations of Art” will be on display for the entire month of November.